It's never been easier to talk while you walk. You can quickly and easily view incoming messages on your Gear Sport, so you don't even need to take out your phone. You can also manage your notifications so that you only see the really important updates. Finally, you can practice those sun salutations in yoga class in peace and quiet. If you want to take a break from your jog through the park to send a quick "what's up?" to a friend, you can do that. 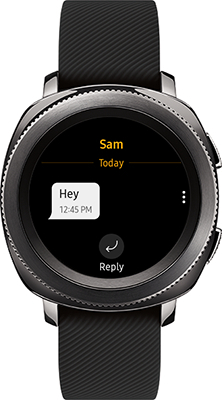 Learn how to send replies quickly and effortlessly from your Gear Sport. 1 To reply to a message, touch Reply. 2 To see more replies, swipe up. 3 To send a reply, touch the desired response. 4 To edit the replies, touch Edit responses. You can create personalized responses or edit existing responses. Answer important messages just like that on your Gear Sport! Are you always getting texts or calls while you’re out walking your dog? Let your contacts know you’ll get back to them soon by setting up Quick Messages on your Gear Sport. You can edit or add messages for an arsenal of quick replies at your fingertips. 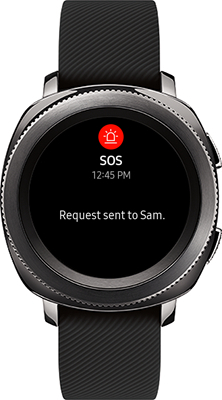 1 Open the Samsung Gear app on your phone, and then touch SETTINGS. 2 Touch Quick messages, and then touch Quick responses. 3 View the preset messages. To add a message, touch the Add icon (bottom right corner). 4 Type your message and then touch SAVE to add it to your quick messages. Same goes for incoming calls. Let them know you'll be in touch ASAP with a quick text message. 2 Touch Quick messages, and then touch Call-decline messages.